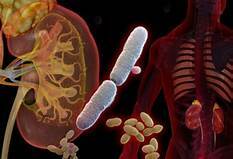 Urinary tract infection (UTI) diagnosis is suggested by clinical findings (dysuria, pollakiuria) and confirmed by microbiological analysis of urine. Upon detection of pathogenic agents in the urine, antibiotic susceptibility testing (AST) should precede targeted antibiotic treatment. The growing prevalence of multiple resistant strains is a factor that poses serious challenges to antimicrobial therapy. Purpose: The aim of the study is to evaluate microbial resistance in patients with UTI’s at the St. Parascheva Infectious Disease Hospital in Iasi, Romania. Results: Frequently occurring infectious agents in the lot included gram negative bacteria (GNB), Enterococcus sp. and Candida sp. A percent of 37.8 % of strains were beta-lactamase releasing. The authors also noted increased gram negative bacteria resistance to beta-lactams. Conclusions: The bacteria isolated in decreasing order by frequency were: Escherichia coli, Pseudomonas, Enterococcusand Enterobacter. In order to avoid the occurrence of pan-resistant strains, treatment should be preceded by AST and maintained for an adequate period of time. Keywords: urinary tract infection, resistance, E. coli, beta-lactams. Coman I, Secasan I, Feciche B (2008). Infecţiile tractului urinar. În I. Sinescu, G. Gluck et al, Tratat de Urologie. Ediţia I, Ed. Medicală, Bucureşti, 2008; 875-932. Naber KG, Schaeffer AJ, Heyns CF (2009). International Consultation on Urogenital Infections, Stockholm, Sweden, March 2009. Urogenital Infections, EAU, edition 2010.